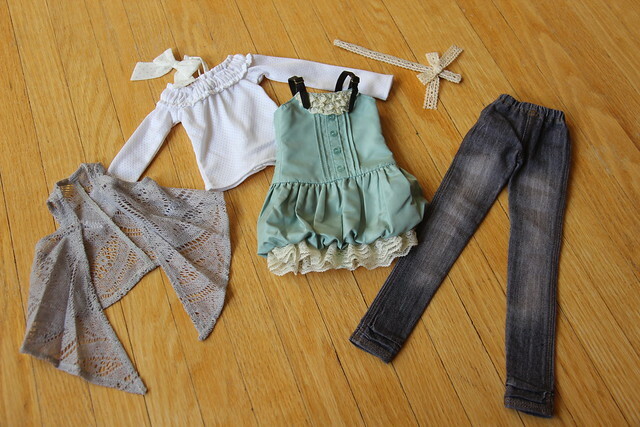 This set comes with the headband, white shirt, knit vest, dress and denim leggings. 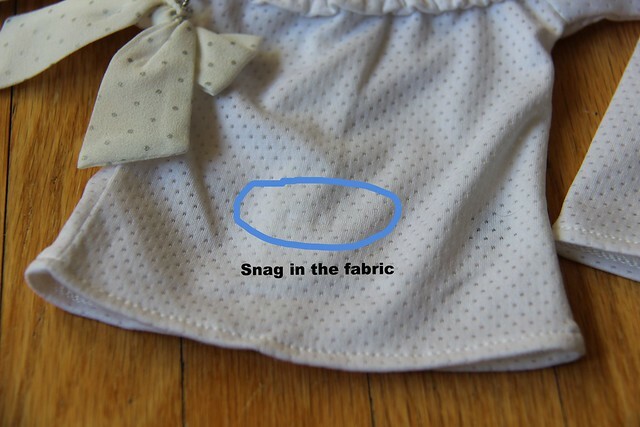 The headband comes packed flat and can be gently shaped to fit the doll’s head, and then flattened again for storage. The white shirt is made of a fabric that reminds me a bit of sports jerseys. It has little holes in it and is the type of fabric that can easily snag on velcro or other sharp objects and create horizontal “pulls”. With that said – the shirt does up in the back with velcro! Be careful not to get the “hook” side caught on the shirt! At least Volks put the “hook” side facing out so it’s less likely to cause any mishaps but I still somehow snagged the front of the shirt a little bit. It’s not very noticeable but I’m pointing it out so you can see what I’m talking about. There is a cute elasticized ruffle at the neckline and a couple of straps that are worn halter style around the neck and have a snap under the bow. If you don’t like these you can tuck them into the shirt. The bow is made of a cute polka-dot chiffon fabric. If you’re wondering why this is set is called the “balloon dress” – this puffy type of skirt is called a Balloon Skirt. Really – google it, I’m not making this up! 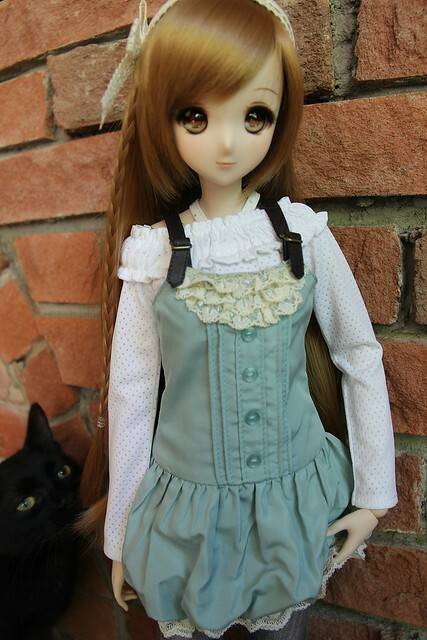 ^__~” The little dress is made of a strange polyester fabric that reminds me of what I use for dress-linings. The little buckles on the shoulder are functional so you can adjust the length of the straps. It closes in the back with metal snaps and is lined with the same fabric inside. I love the little pleats down the front and the lace details. Luckily the dress covers up this crime of fashion! The leggings are too tight to fit the DDdy and will be a bit long on a DDS, however you can shimmy them up a bit under the dress to make the bottoms of the jeans fall where you’d like. Alternately, although they do fit the Smart Doll the jeggings are a bit too short (Smart Dolls have longer legs than Dollfie Dreams) so I shimmied them down about 1cm. The weathering pattern on the jeans is different on the front and the back. How you want to wear these is open to interpretation but at I put the side that looks like “bum wear” on the back and the longer pattern in the front looks like “thigh” weathering to me and it actually looked odd in the photos so now I flipped them around. 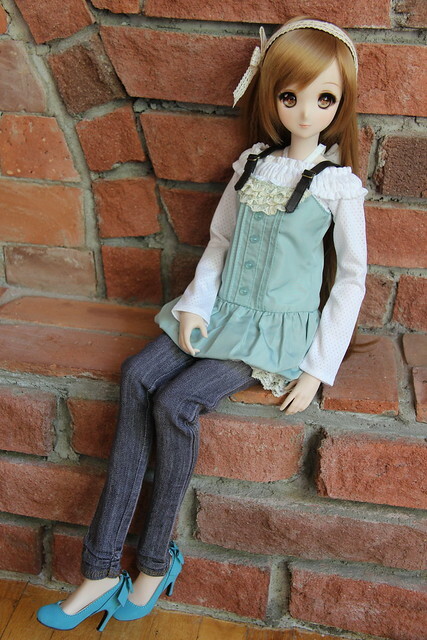 It turns out this is how Volks’ stock photos show the jeans being worn too – hehe! The most important thing I need to mention about these jeggings is that even though they are not lined THEY DO NOT STAIN! 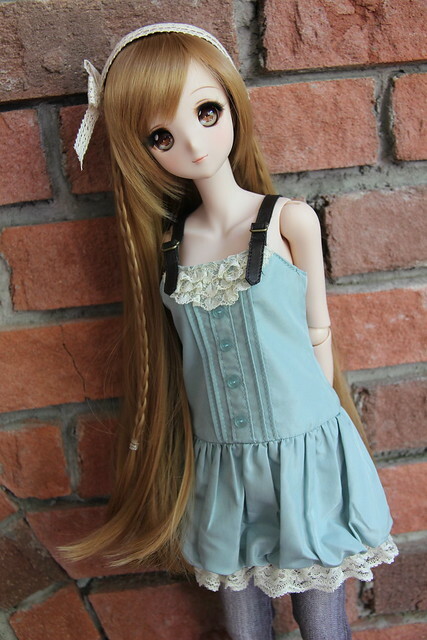 This has been tried and tested with the previous 2 releases of this outfit, and I had Mirai wearing the jeans from this set for 48hrs and there’s not a spot on her. This is wonderful news for DD owners! They are sewn with white thread on the inside, and there’s no “VS” label on the inside. The grey vest is an asymmetric knit piece that layers on top of the ensemble. Be careful not to get it snagged on things long fingernails, cat claws or velcro 😛 It actually has some pleats pressed into it which is a neat little detail. This set retails for 6,480 and is a really good value for the number of pieces it includes. 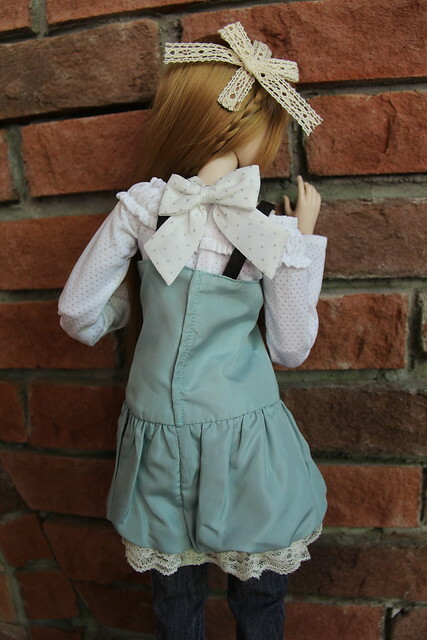 I’ve paid much more money for just a pair of nice Dollfie jeans 🙂 This set is extremely popular and is currently sold out on Volks International. North American customers will get a second chance when it comes to Volks USA in several weeks and hopefully Volks will release it again in the near future. At this Dolpa they released the pink colour-way in MDD/MSD size and it also sold out very quickly! Spooky approves of this outfit. 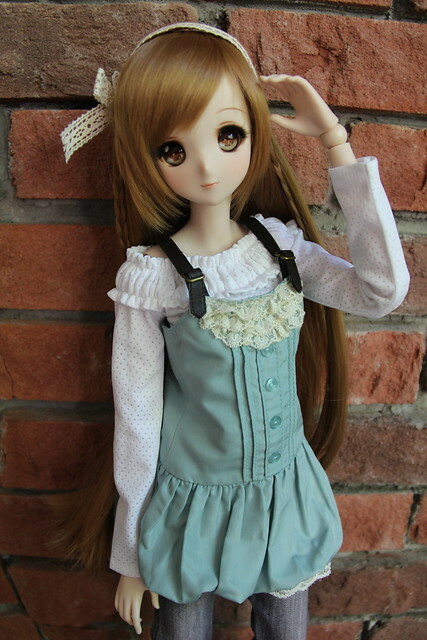 This entry was posted in Dollfie Dream, Review and tagged Balloon Dress, green apple, outfit, review, Volks by archangeli. Bookmark the permalink. Hiya! She should fit the SDGr clothes. 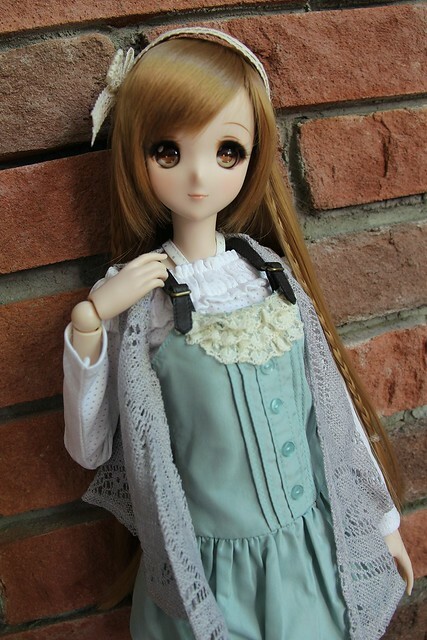 Which bust size do you have on your Mirai? I only have the (default) small bust to compare >_<"
Mirai's legs are longer than DD's and SDGr a little bit but that should be ok still. Winter Smile Nono is a SDGr too. 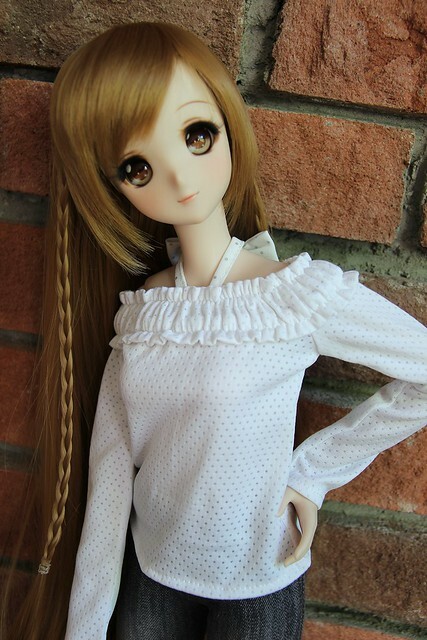 I haven’t seen Tae’s Lovely Dress in person but if the blouse doesn’t stretch it would fit nicely on the small Mirai bust; probably be too tight on the medium >_<"